Most of us own an Android phone and tablet, and at some or the other point in time we must have faced an issue managing them, as they are quite different compared to a PC. To our rescue comes Wondershare’s MobileGo. 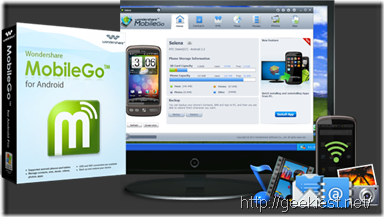 It is a life saver for those who want to manage their Android Phones and tablets. It can easily manage music, videos and texts with ease, and comes with support for popular Windows OS such as Windows 8/7/XP/2003/Vista. Usually it costs $39.95 to buy MobileGo, but thanks to a promotion by German Wondershare site, you can now get a licensed copy of this jewel for absolutely Free. Head over to this link and enter your name/email as shown in the image below. Then click the button “Gratis holen” and you will immediately receive your license code in the specified email. In case you want detailed step-by-step help to use MobileGo, do visit this link for help. PS: This is a time limited giveaway and will get over in about 4 days from the date of making this post. Also it doesn’t comes with free upgrade or customer support.